I have been attending a Cookie Swap hosted by my friend Melinda and her daughter Jenny for the past ten years. It is hard for me to believe that ten years has past so quickly. The good news is that each year the cookies get better and better. It is an event that I look forward to as much as a child looks forward to a visit from Santa Clause! It is an event filled with friendly, fabulous cooks; fantastic food; and fanfare flourishes because, let’s face it, it is all about the COOKIES! This year I tried to beat out the competition with my Gingerbread Reindeer with the Red Nose recipe only to lose to a Snowflake! In retrospect, I may have won, if only I had submitted my Reindeer with the Bloody Nose. His nose was bleeding because the other Reindeer were bullying him with taunts which led to antler jabs that pierced my reindeer’s nose. It is such a sad story that my poor reindeer with the bloody nose may have won on the sympathy vote alone. A picture says a thousand words, you be the judge. Use your favorite gingerbread cookie recipe to bake these cookies. 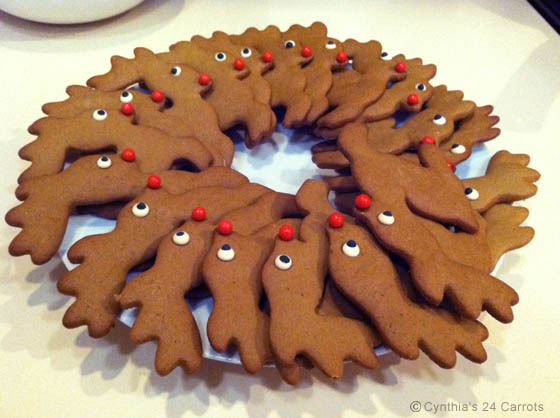 Roll cookies out and cut into desired shapes with a reindeer cookie cutters. 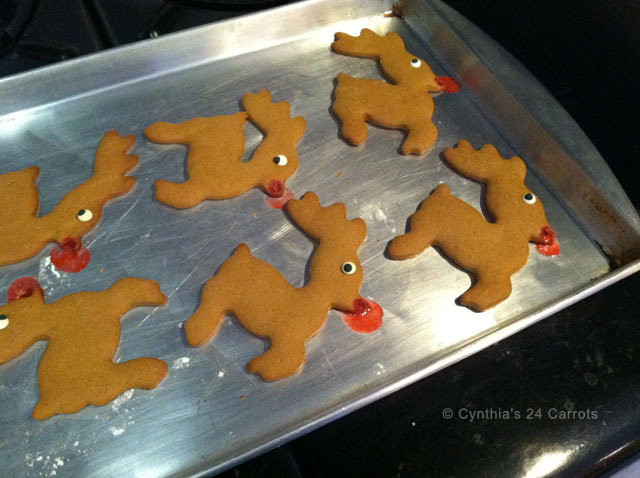 I add one royal icing eye to each reindeer shape and bake according to your recipe. As soon as they come out of the oven take one red bead and make an impression in the spot where the red nose would look best; do this quickly or the cookies will harden making it harder to keep the red noses in place. Then dab a small amount of clear corn syrup with a paint brush on the impression and add 1 red bead, continue until all are decorated. 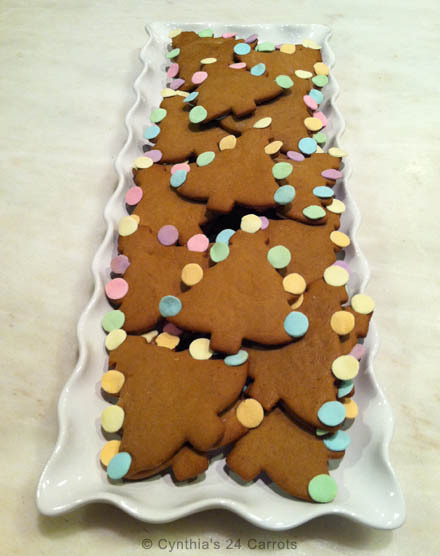 On a flat surface, allow the cookies to rest so that the noses dry completely before eating or wrapping them as gifts. Roll cookies out and cut into desired shapes with a tree cookie cutters. Lightly press one piece of confetti disk at the end of each branch and one yellow confetti disk at the top of each tree and bake according to your recipe. Enjoy eating these cookies with a cold glass of milk or wrap them as gifts. Note: For a variation of the Gingerbread Christmas Tree Cookies I like to sprinkle a few cookies with dark green sugar crystal just before baking adding one yellow confetti disk at the top. Package them in clear bags tied with green ribbon for a sweet treat for someone special on your Christmas Shopping List.